Well, fellow Feschino freaks! 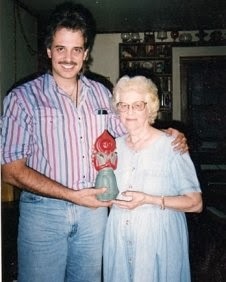 Just when you thought you had heard everything about the "Flatwoods Monster" incident, the authority on the case, one Frank Feschino, Jr. releases some never before heard, first-hand testimony of primary witness (the late) Kathleen May. Here's some stuff to put a decided wave in your short and curlies! Some back-story: during his investigation into the Flatwoods incident beginning in 1991, Feschino, after a long hard slog to win their trust, worked very closely with the May family. He interviewed matriarch Mrs. May numerous times about her close encounter with the giant being come to be known as the "Flatwoods Monster." Feschino transcribed much of her interviews into his books... but not everything! Now, for the first time, Frank is releasing some startling testimony from Mrs. May discussed during two particular taped interviews in West Virginia. Remember this stuff's on tape folks. Intrepid researcher Feschino reveals startlingly visceral information about the aftermath of the terrifying 1952 "Flatwoods Monster" incident involving her two boys, Freddie and Eddie, among others, and the illnesses they endured... ...suffering their whole lives as it turns out. To get the elephant out of the room I asked why he waited until now to release this information. Feschino stated, "Alfred, it was all about respect for sensitive issues. I was just waiting for the right time for this story to reach further out into the public, you know? The story needed to be taken more seriously—become better known—become better known...before more insightful, but by the same token, more personal evidences get trotted out." He continued, "Thanks to my books, radio, TV—your awesome blogs—my research has reached out widely across the world, is very well-known, and being taken very seriously. This is a good thing!" "Basically? I was awaiting the right moment for this information to be seen, and not get lost in some short-attention-span-old-news-shuffle...," Frank took a long breath, "...After my trip to Hollywood, and the interview for the documentary 701-The Movie, I knew my research and books had indeed been far-reaching! I realized it was time." Frank continued, "Look at it this way, I want to release this information now so people can have a real appreciation for what happens to folks when it's their blood and sacrifice that is the ink writing the primary historical page. Heroes should be celebrated, and these people had their cross to bear for this history, and have borne that cross better than 60 years. ...It's time"
What follows now is a fast recap of the particular portion of this incident, bringing the reader up to speed regarding the aforementioned unheard testimony of Mrs. May. During the encounter on the Fisher Farm that night September 12, 1952 which included Kathleen May, her two sons, and six other boys, she was the closest witness to the strange metallic structure nearly 12-feet tall come to be known as the "Flatwoods Monster." 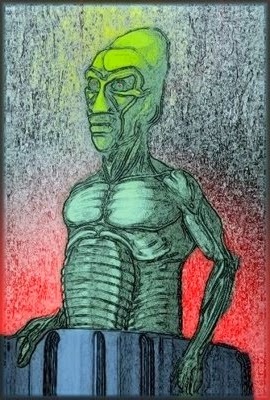 The reader will remember, and as previously stated in Feschino's research and the testimony of witnesses: the monster was more mechanical than of a flesh... ...was some sort of a "hovering craft" or "encounter suit," and appeared to be a lifting device or system emitting a noxious exhaust gas through long pipes! That exhaust, a disgustingly odored miasma smelling of burnt sulfur, had billowed up throughout the area, remember, creating a cloying and distressing mist along the path where unsuspecting witnesses, walking smartly up the incline and so nearing the famous old oak tree where the "Monster" was located, encountered same. The tense music is at its denouement. Though, stop. That's not where this story goes. See, what about that odiferous gas? This sulfur stink is referred to also as a strong metallic smell by the first person witnesses. Previous to their encounter near the tree, Mrs. May reports to Frank, "[when] we got up there, we could smell a kind of... metallic odor ...and it looked like it was getting foggy." As Mrs. May and the boys walked up the path, they all walked through this gaseous mistiness of faux-fog, now everywhere along the path. It immediately effected them severely. One of the boys called it a "horrible odor" stating, "It smelled like sulfur and really sort of made you sick!" Now, at the exact moment of their encounter near the tree, Mrs. May was standing next to Gene Lemon, while her son Eddie was walking just behind her. May's other son, Freddie, was at the wooden gate behind them all, readying to climb over it. Mrs. May told Frank that she had an "irritated throat" and that her lungs began to suffer from inhaling the gas, "in the chest area." She stated, "It was very penetrating. It effected me a good bit." The other boys, suffered as well. Neil Nunley, who was near Lemon, is heard to say, "We just ran into this mist. It wasn't any regular mist, it was a funny looking mist. Burnt you up, it did. It burnt your eyes and throat." Freddie May told Frank, "It was very hazy in the area along the path. It was correspondingly misty along the tree area." Fred explained to Frank, "... And that nasty smell... the smell was similar to the old TV tubes burning out in the old sets from years ago. A tube would burn out, remember, and you have what we'd call that 'metallic smell.' "
Mrs. May told Feschino the following about Gene Lemon, "He did have some irritation in his throat and nose as well as I can remember." She also told Frank that later on "Gene vomited during the night." Also In 1952, about two weeks after the incident, two members of the Los Angeles, California based research group, "Civilian Saucer Investigation," visited Flatwoods and interviewed witnesses. In one of their reports they documented, "Gene was so severely ill during the night that he was in convulsions and had attacks of vomiting." They added, "After two weeks, Gene Lemon still was not able to swallow carbonated drinks." They also documented, "Soon the throats of the boys were so swollen that they could not even drink water. Examination by a local doctor showed symptoms of Mustard gas." The information that Frank now reveals was obtained first-hand from Mrs. May during two interviews. It connects to the aftermath of the incident and involves her two boys who became quite sick themselves. At the time Freddie was 11-years old and Eddie was 13. These boys got sicker than most realized and their sickness was not brought on by fright. Frank tells me that in January of 1953, USAF public liaison Albert Chop told researcher Donald Keyhoe the following information, "The boys' illness was brought on by their fright." he reports. Glib and reasonable sounding. That is a gloss, not even a reasonable supposition. And while we're on the subject of skeptibunky argle-bargle, the sighting was not attributed to a "barn owl" as noted by skeptic Joe Nickell. In reference to the bad smell, Nickell states, "As to the nauseating odor, that has been variously described as a 'sulfurous smell,' 'metallic stench,' gas-like mist, or simply a 'sickening, irritating' odor...The effect on three of the youths, particularly Lemon, was to cause nausea and complaints of irritated throats." In conclusion, Nickell observes, "This element of the story may be overstated." Flag down! That really is a meaningless statement... all denial and based entirely on supposition—bereft of all sense and sans all sensibility. Nickell propounds many canted propositions about this case and others, as illogical as they are reductionist and as unscientific as they are unreasoning. FRANK: Did the kids have any medical problems? MAY: Oh Yeah! A-huh. Gene vomited all night and I had to take my boys to the doctor the next morning, and their mouths, clear down to their rectums, were as raw as a piece of meat. FRANK: Was that a local doctor in town? FRANK: Do you remember his name? MAY: Hutchinson, Dr. Bernard Hutchinson. FRANK: Did the boys ever go to a hospital? MAY: No—but they took shots for over a week. FRANK: Did it seem to help them? MAY: Yes, but they couldn't even go to school. FRANK: So, they were out of school for a week? FRANK: After the kids were sick, were there any other effects that had come back—any sickness? FRANK: Did you have any symptoms? MAY: Well, I had a little irritated throat. MAY: Yes, it was very penetrating. FRANK: Do you think - since you were that close to the "Braxton County Monster" [a car length] - that any of the medical problems that you have had over the years, could be attributed to that? The following is another transcribed section from a later taped interview between Frank and Mrs. May in Fred's presence while sitting in Mrs. May's apartment. MAY: They [the doctors] was all uneasy about the boy's membrane—the way it [the ill effects] moved so fast and made 'em sick. He [Fred] had a sore throat and lord, for days! Eddie too, right. [looks at Fred sitting to her right, who nods yes] I had to take them to Dr. Hutchinson. He had to give them shots. I had to take em' [the boys] everyday—for over a week. FRANK: What were the shots for? MAY: Infection. It was raw—from their nostrils, clear down to their throats and to their rectums. FRANK: From inhaling the gas? FRANK: It didn't seem to effect you as much—did it? MAY: It effected me a good bit! What shook down out there, people? What stranger occurrence than we know, perhaps stranger than we can know, happened on that Indian Summer in 1952? I would know. It may end that Frank Feschino told me so. If the reader wants more information please go to flatwoodsmonster.com ...Read on! BEHIND THE PARANORMAL w/ Ben and Paul ENO! Last month I posted an article regarding yet another firsthand witness who had come forward to explain that he was seemingly involved in the "Flatwoods Monster" affair of September 1952. 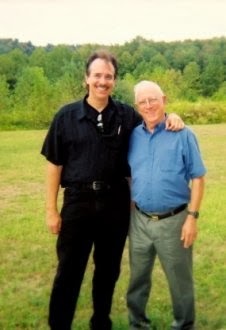 In that article, the new Braxton County witness contacted Frank Feschino, Jr. with information about his sighting occurring on his family's property in "Strange Creek" WV, during the early morning hours of September 13, 1952. 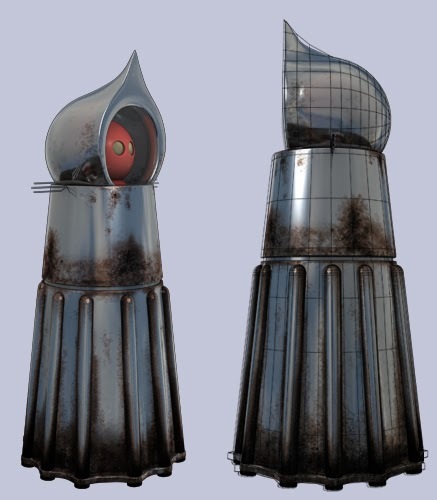 The witness, a boy at the time, had described to Frank a large 8-9 foot-tall, glowing, if metallic-looking structure, which was gray/aluminum in color, and hovering up the driveway toward his home! Yes, reader, there does seem to be a direct connection between this incident and the "Flatwoods Monster" encounter on the Fisher Farm, as well as the "Frametown Monster" incident involving the Snitowsky family occurring September 13, 1952. See, the tiny town of "Strange Creek" is located just southwest of Frametown, where the Snitowsky incident occurred later that night. Frank had called me and explained the incident after speaking to the witness that afternoon. Subsequently, I wrote the article, "Frank Feschino and the Incident at Strange Creek." 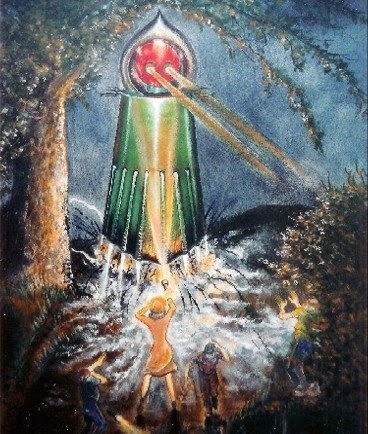 Since that last article, Feschino, a school trained illustrator remember, has been working diligently on an illustration faithfully depicting that large metallic-like structure that the "Strange Creek" witness had described to him during their conversation. For background, I will explain how all three of these so-called "Monster" incidents are connected, and were actually the same entity sighted at three different locations, Flatwoods, Frametown, and Strange Creek. 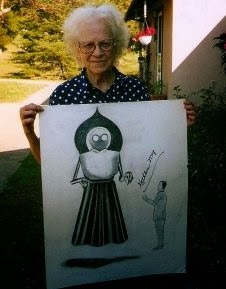 An overview of Feschino's research shows, one will recall, that the "Flatwoods Monster" was actually a large—nearly 12-feet-tall—metallic-seeming structure. 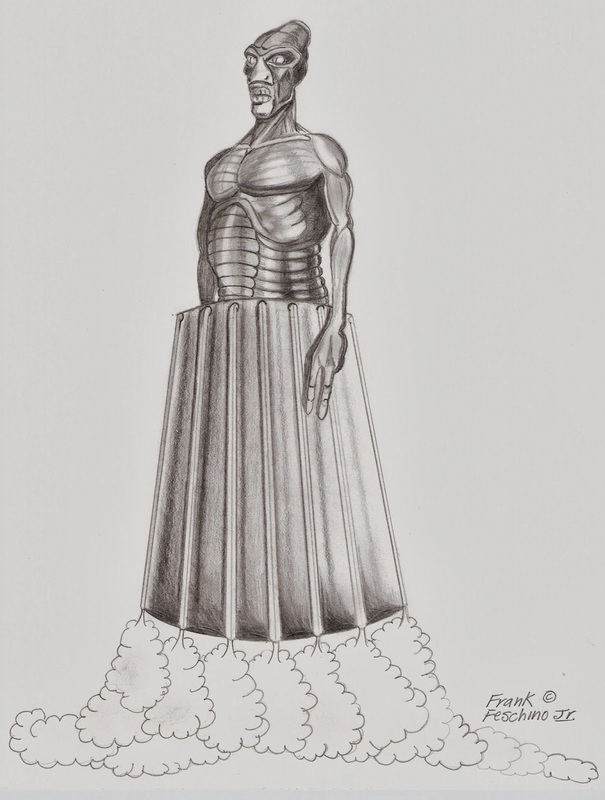 By working with the actual eyewitnesses and past documentations of the case, Feschino had concluded that this structure was likely some sort of a hovering spacesuit containing a large "being" within. This "spacesuit," then—a shell—was a mode of transportation complete with a propulsion system of some type which lifted and carried the occupant across the terrain over which it traveled. The overall appearance of the structure was described by witnesses, then—and now—as looking "mechanical." This apparatus also acted, apparently, as a protective suit for an occupant forced to leave its downed craft on the Fisher Farm in Flatwoods and move into a foreign environment. One might imagine an astronaut departing his lunar module and walking on the surface of the moon. Additionally, this metallic-like structure could have possibly protected the occupant from hostile actions taken against it. It could have, reader, been a suit of armor. Now, through separate documentation and other testimonies, Feschino was able to track the flight path of the "Flatwoods Monster" after it departed Flatwoods just after its encounter with Mrs. May, her two sons, and the other boys. It had reboarded its damaged craft, followed the Elk River southwest, and then flew into the secluded region of "Frametown" where it landed on James Knoll, approximately seventeen miles away. About one full day later, George and Edith Snitowsky encountered the "Frametown Monster" on the following night at about 8:00 p.m.
Feschino concludes that the being the Snitowskys saw and closely encountered that night, was actually the "Flatwoods Monster" with its outer helmet, inner helmet and upper torso spacesuit "parts" removed. There, the large occupant being was seen in the flesh from its head down to the waist area, yet was still encased in the lower portion of the apparatus and hovering very near to them. During this incident, the being's large head, bloated upper body, long arms and forked, three fingered hands was seen by the witnesses, terrified at the sight of it, remember, and even sickened, made physically ill by its noxious exhaust. Presently, now, we have the recent witness who just came forward to Feschino last month explaining his encounter in Strange Creek on the early morning of September 13, 1952 at about 3:00 am. This "Strange Creek" incident does fit into the existentiality of events occurring in Braxton County during that fateful twenty-four hour period between the "Flatwoods Monster" encounter and the "Frametown Monster" encounter. This sighting occurred about seven hours after the Flatwoods encounter and about fifteen hours before the Snitowsky sighting. Moreover, Strange Creek is located just south of James Knoll in Frametown, where the craft went down after Flatwoods. This indicates that the being seemed to have departed its damaged craft after landing in Frametown and was seen next in Strange Creek around 3:00 am and minus its helmet. 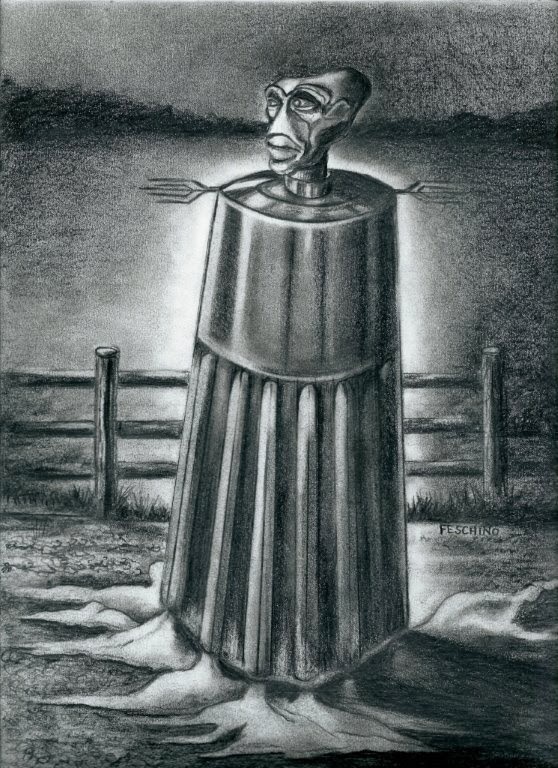 Here in Strange Creek, then, we actually have the second sighting of the "Flatwoods Monster," the third sighting being in Frametown, later that night, and the tall structure at last minus its helmet and chest-piece. Here is an interesting point to note in the Strange Creek incident: when the Strange Creek witness saw Feschino's illustrations of the "Flatwoods Monster" as described by the Flatwoods witnesses, he told Frank that he definitely did not see the big helmet or anything that resembled a helmet. He also said to Frank that since it was said to be wearing a helmet in Flatwoods, it must have taken it off before he saw it in Strange Creek. Subsequently, Feschino has reasonably concluded that the being must have taken the outer helmet and inner helmet portions of the suit off after it landed in Frametown but prior to the Strange Creek sighting. Later that night, the "Monster" was seen again a short distance away by the Snitowsky's. There the upper torso appears to have been removed.